Taylor Alison Swift (born December 13, 1989) is an American singer-songwriter. One of the leading contemporary recording artists, she is known for narrative songs about her personal life, which have received widespread media coverage. As a songwriter, Swift has received awards from the Nashville Songwriters Association and the Songwriters Hall of Fame, and was included in Rolling Stone's 100 Greatest Songwriters of All Time in 2015. She is also the recipient of 10 Grammy Awards, five Guinness World Records, one Emmy Award, 21 Billboard Music Awards, 11 Country Music Association Awards, eight Academy of Country Music Awards, and one Brit Award. Taylor's 2017 album release continues her chart-topping success, debuting on the Billboardae 200 chart at number 1, led by the previously released singles Look What You Made Me Do and ...Ready for It. Our songbook features these 2 songs plus 13 more arranged for piano and voice with guitar chord frames: Call It What You Want - Dancing with Our Hands Tied - Delicate - Don't Blame Me - Dress - End Game - Getaway Car - Gorgeous - I Did Something Bad - King of My Heart - New Year's Day - So It Goes... - This Is Why We Can't Have Nice Things. This book features authentic transcriptions in the original keys of a dozen of the biggest hits from country/pop crossover superstar Taylor Swift in voice with piano accompaniment format: Back to December - Blank Space - I Knew You Were Trouble - Love Story - Mean - Our Song - Shake It Off - Teardrops on My Guitar - 22 - We Are Never Ever Getting Back Together - White Horse - You Belong with Me. All 16 tracks from Swift's record-breaking blockbuster album. With a winning mix of pop sounds, country twang, and confessional lyrics, Speak Now is the highly anticipated follow-up to Taylor Swift's hugely successful sophomore release Fearless. 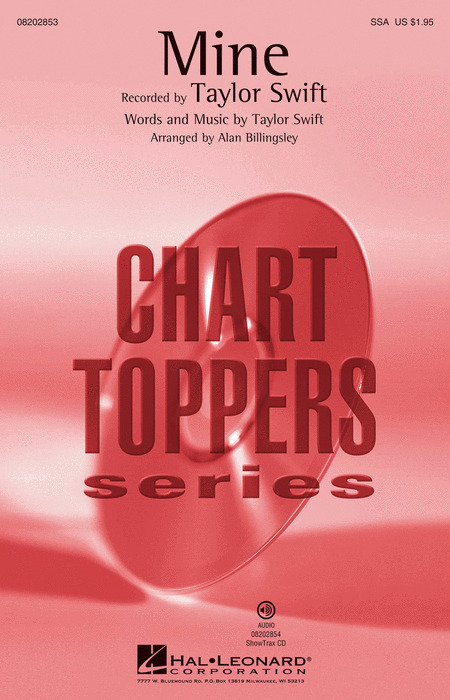 This folio features piano/vocal/guitar arrangements of all 14 tracks from the celebrated songstress. All that's missing are your vocals! 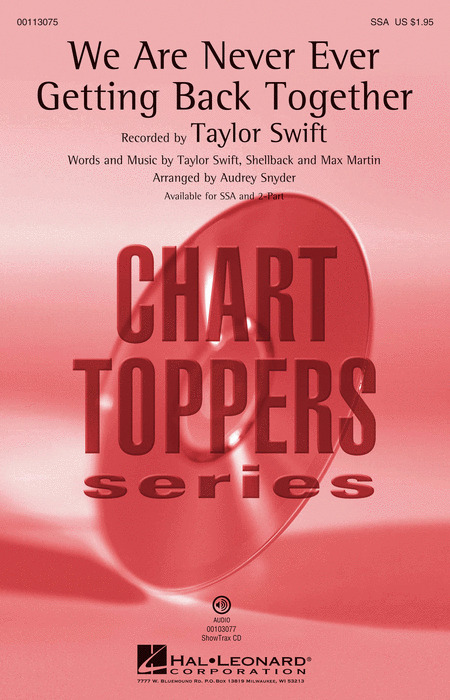 8 favorites from pop/country superstar diva Taylor Swift are presented in this book which includes the lyrics, vocal lines and piano accompaniments for each song, plus online audio tracks containing demos for listening, and separate backing tracks so you can sing along. Taylor Alison Swift (born December 13, 1989) is one of America's top country-pop singer-songwriter. In 2006, she released her debut single "Tim McGraw", which peaked at number six on the Billboard country charts. Later in October 2006, she released her self-titled debut album, which produced five hit singles on the Billboard Hot Country Songs charts and was certified 3 Multi-Platinum by the RIAA. The New York Times described Swift as "one of pop's finest songwriters, country's foremost pragmatist and more in touch with her inner life than most adults". Swift was the biggest selling artist of 2008 in America with combined sales of more than four million albums. Swift's Fearless and her self-titled album finished 2008 at number three and number six respectively, with sales of 2.1 and 1.5 million. She was the first artist in the history of Nielsen SoundScan to have two different albums in the Top 10 on the year end album chart. 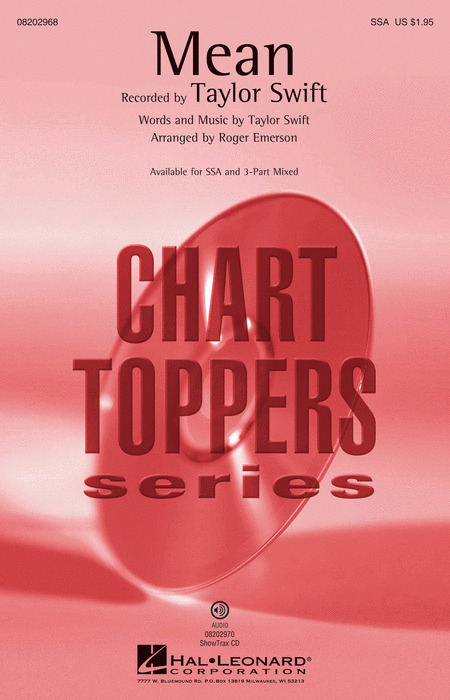 This Pro Vocal series contains the lyrics, melody, and chord symbols for eight of his hit songs. The CD contains demos for listening, and then separate backing tracks so you can sing along. The CD is playable on any CD, but it is also enhanced for PC and Mac computer users so you can adjust the recording to any pitch without changing the tempo! Perfect for home rehearsal, parties, auditions, corporate events, and gigs without a backup band. Or for singing just for the fun of it! Taylor Alison Swift (born December 13, 1989) is one of America's top country-pop singer-songwriter. In 2006, she released her debut single "Tim McGraw", which peaked at number six on the Billboard country charts. Later in October 2006, she released her self-titled debut album, which produced five hit singles on the Billboard Hot Country Songs charts and was certified 3 Multi-Platinum by the RIAA. The New York Times described Swift as "one of pop's finest songwriters, country's foremost pragmatist and more in touch with her inner life than most adults". Swift was the biggest selling artist of 2008 in America with combined sales of more than four million albums. Swift's Fearless and her self-titled album finished 2008 at number three and number six respectively, with sales of 2.1 and 1.5 million. She was the first artist in the history of Nielsen SoundScan to have two different albums in the Top 10 on the year end album chart. This matching folio features 11 songs from the 16-year-old country-pop singer's debut album. Grammy-nominee Taylor Swift is the top-selling artist of 2008, and the first in the history of Nielsen SoundScan to have two different titles in the Top 10 on the year-end album chart. Our matching folio to her latest chart-topper features the crossover hit single "Love Story" and a dozen more: The Best Day - Breathe - Change - Fearless - Fifteen - Forever & Always - Hey Stephen - Tell Me Why - The Way I Loved You - White Horse - You Belong with Me - You're Not Sorry. Teen pop star Taylor Swift has evolved into very much the young artist by crossing genres with ease! Featuring a happy pop backbeat, "You Belong with Me" climbed to the top of the Hot 100, Country and AC charts. "Love Story" is a charming Romeo and Juliet story told through music and the catchy "Mine" was country pop hit. Her chart hit from 2011 "Mean" celebrates the underdog and the dreamer, and helps those who may be bullied understand that "it gets better" while imagining the bully will someday receive comeuppance! With its sweet country harmonies and sassy lyrics, this easily-learned song will be an entertaining addition to your program! Piano accompanied. When Taylor Swift's first official pop album, 1989 was released in October 2014, it quickly achieved record-breaking sales. According to Billboardae, it sold almost 1.3 million copies in its debut week, the largest sales week for an album since 2002 and made Taylor the first artist ever to have three albums top $1 million in sales in a week. Our songbook features all 13 songs from the album, including the mega-hit Shake It Off, plus: All You Had to Do Was Stay - Bad Blood - Blank Space - How You Get the Girl - I Know Places - I Wish You Would - Out of the Woods - Welcome to New York - and more. In Taylor Swift's second #1 hit from her fifth album, she seeks new love in a powerful new voice. Interesting vocal effects make this a great selection for pop and show groups. 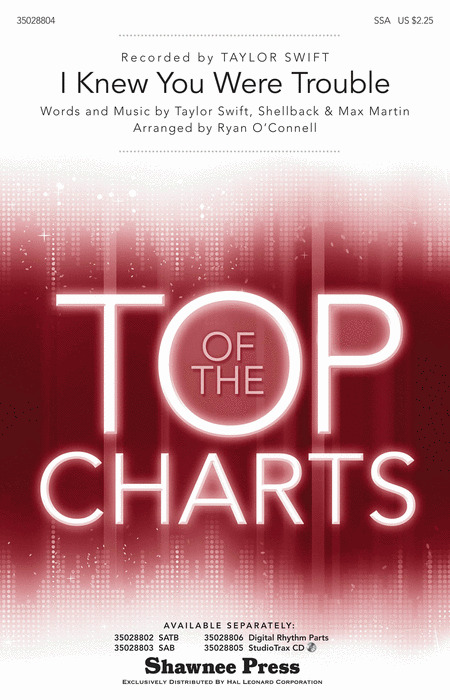 This chart-climbing track off Taylor Swift's new album Red is said to be one of her favorites. It tells the story of being frustrated with yourself for having a broken heart over a person you knew was wrong for you from the beginning. Great story-telling with a pop-rock feel mixed with just a thin line of country - your choirs will love it! It's a charming Romeo and Juliet story told through music in this Taylor Swift single that climbed both the Billboard Country and Pop Charts. Your SSA groups will love singing this refreshing and tuneful song! Available separately: SSA, ShowTrax CD. Duration: ca. 3:50. Taylor Swift's chart hit from 2011 celebrates the underdog and the dreamer, and helps those who may be bullied understand that "it gets better" while imagining the bully will someday receive comeuppance! With its sweet country harmonies and sassy lyrics, this easily-learned song will be an entertaining addition to your program! 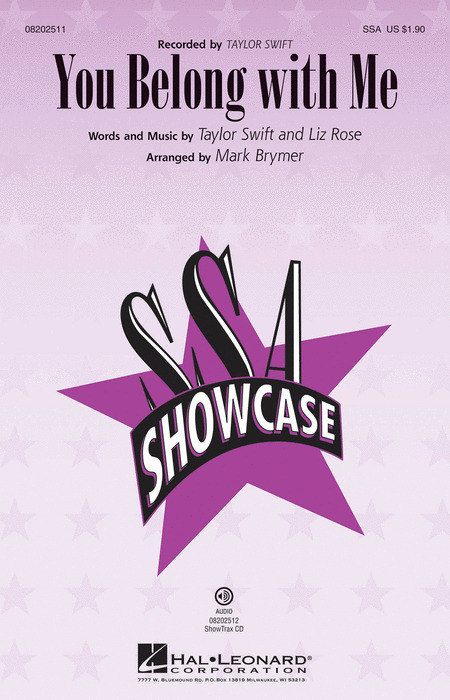 Available separately: SSA, 3-Part Mixed, ShowTrax CD. Duration: ca. 3:10. Taylor Swift's chart hit from 2011 celebrates the underdog and the dreamer, and helps those who may be bullied understand that it gets better while imagining the bully will someday receive comeuppance! With its sweet country harmonies and sassy lyrics, this easily-learned song will be an entertaining addition to your program! 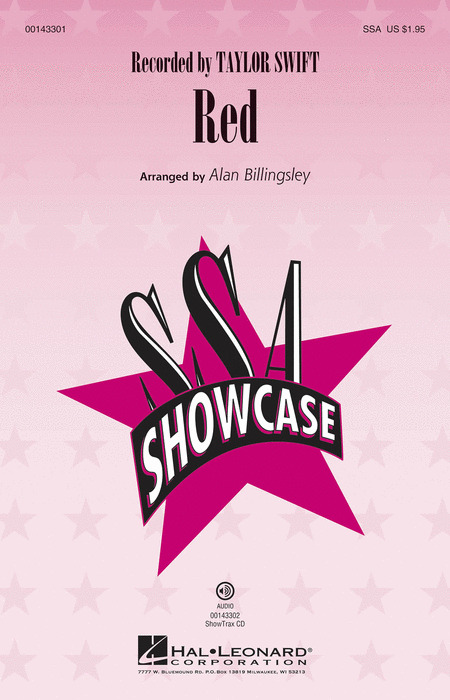 Available separately: SSA, 3-Part Mixed, ShowTrax CD. Duration: ca. 3:10. This catchy country pop hit by mega-star Taylor Swift soared up the pop, country and AC charts in 2010 to critical and popular acclaim. Your girls' groups will love performing this tuneful and charming song! Available separately: SSA, ShowTrax CD. Duration: ca. 3:55. The second release on her critically acclaimed album 1989, Taylor Swift continues to turn heads with her transition from country to pop. With a breathless pop sound, always interesting vocals and a certain amount of autobiography, this song demonstrates why Taylor Swift is the star she is. Fantastic for pop and show groups! Soaring up both the pop and country charts, Taylor Swift continues to amaze! Great lead vocals and awesome triadic harmonies make this a super choice for SSA pop and show groups who want to make an impact! The lead single from the hit film The Hunger Games features Taylor Swift and The Civil Wars and opens with a gentle folk style melody crooning a lullaby, but with an ominous background that gradually builds into a military style cadence. Cascading vocal harmonies will make this a favorite of SSA vocal groups and mesmerizing to audiences. Country-pop singer/songwriter and superstar Taylor Swift has taken the music world by storm! Her personal and autobiographical approach to songwriting has endeared her to her fans and this 5-minute mini-medley will showcase your group with songs they love to sing. Songs include: Love Story, Mine, Our Song, The Story of Us, You Belong with Me. 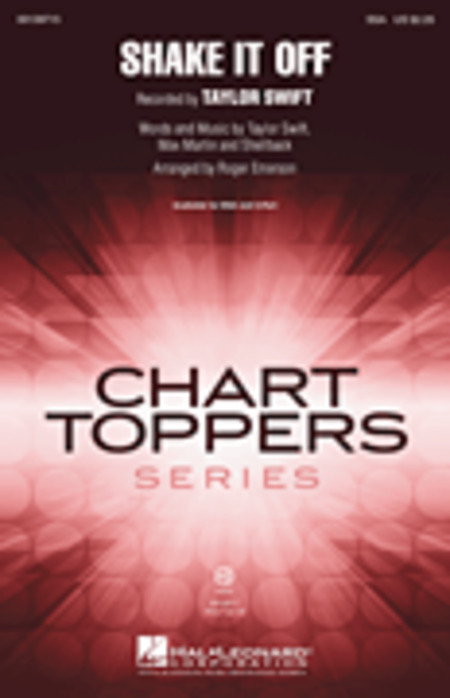 Available separately: SATB, SSA, 2-Part, ShowTrax CD. Duration: ca. 5:20. Three songs from the popular Hunger Games movies create an emotional expression that perfectly portrays the courage and vulnerability of the movie's heroine, Katniss. This 7-minute medley includes Eyes Open, Safe & Sound (both by Taylor Swift) and We Remain (Christina Aguilera). Available separately: SATB, SAB, 2-Part, ShowTrax CD. Rhythm parts available as a digital download (syn, gtr 1, gtr 2, bs, dms). Taylor Swift continues racking up the hits! This latest soared to the top of the Hot 100 and was featured on the soundtrack to the film Valentine's Day. Your SSA group will love it! Available separately: SSA, ShowTrax CD. Duration: ca. 2:50. Your girls will love the sassy, conversational tone of this top Taylor Swift hit that identifies all the emotions that come into play in a break up/make up relationship with an unreliable boyfriend! Super fun and great for choreography! 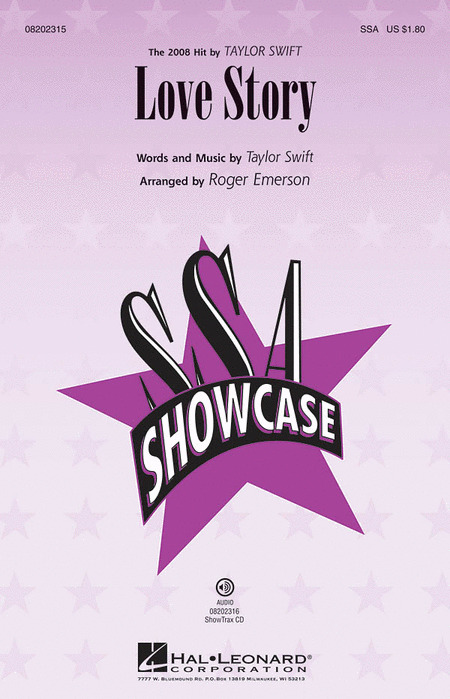 SSA choirs will love the sassy, conversational tone of this top Taylor Swift hit that identifies all the emotions that come into play in a break up/make up relationship with an unreliable boyfriend! Super fun and great for choreography! Teen pop star Taylor Swift has evolved into quite the young artist by crossing genres with ease! Featuring a happy pop backbeat, this song climbed to the top of the Hot 100, Country and AC charts. Available separately: SSA, ShowTrax CD. Duration: ca. 2:55.